Bob Mohelnitsky, his son Mark and Mark’s boyhood friend James Benson — who he ran into at the game. This is not about a baseball game. Or more precisely, this isn’t about just a baseball game. Opening Day in Milwaukee is much more than that. It’s a ritual celebration of a new season and the sense of hope, even a thrilling sense of anticipation that spring represents. But let’s not get too highfalutin. The first day of the baseball season, like St. Patrick’s Day, is also an excuse for drinking to excess and when you live in Milwaukee, that’s not something to be taken lightly. 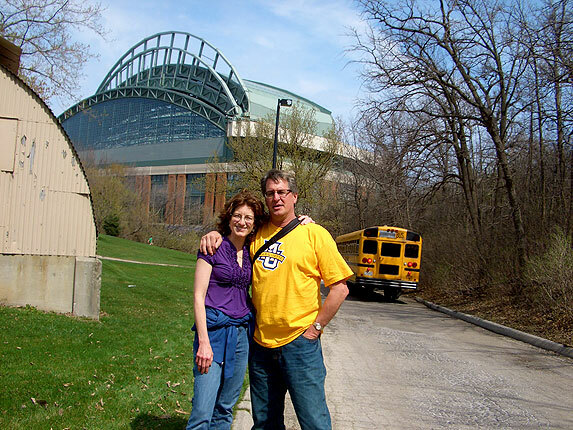 I decided to go to Miller Park on Opening Day fully intending not to enter the stadium. My plan was to wander around the parking lot for an hour or so to report on the ritual known as tailgating. After parking my car on Greenfield Avenue and checking to make sure that no signs indicated that I would get a ticket, I introduced myself to the first group of people I saw as I began the walk across the VA hospital grounds towards the stadium. Katie Benson and friend David Roland of Marinette, Wisconsin. Most of this particular group of five had made the pilgrimage from Marinette, a town north of Green Bay, to take in the game. Their friend Tom Boyle, who now lives in Glendale, had secured the tickets. Just as I was learning their story and making sure I had their names and contact information right we reached the stadium gates. “Aren’t you going in?” Tom asked. “Well, if you want to go to the game, I have a ticket for you,” he said. And so this story took a bit of a change in direction. Even though the phenomenon known as tailgating would make for an interesting story, it’s Opening Day and I got a free ticket! Katie Benson (the group’s sole female) was eager to philosophize on the existential meaning of the day’s experience. Once in the stadium, Boyle directed his friends up to his regular seats on the upper level directly behind home plate. He had two other seats up close along the third base line and we made our way there for about an inning. The sun was out, the air was warm and it was shaping up to be a glorious day. But after one inning, Tom stood up and we found our way to the upper level to join the rest of the group. Now the upper deck seats weren’t bad; being directly behind home plate gives you a fantastic perspective on the whole field. And the change in seats also provided a contrast in fans in the surrounding seats. There’s something a little effete and proper about good seats at a sporting event. You really need to be up with the hoi polloi to feel comfortable shouting at the umpires and razzing the opposing players. 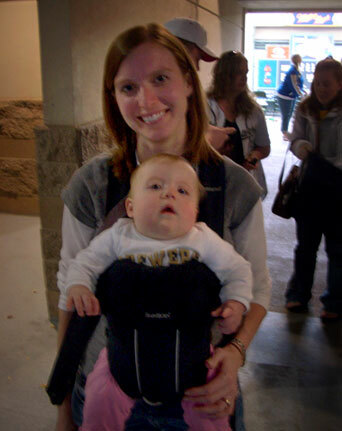 Jodi Mayne of Menomonee Falls and her 9 month old daughter, Taliya, at Taliya’s first Opening Day (and third Brewers game). As you probably know, the game didn’t go well for the home team. 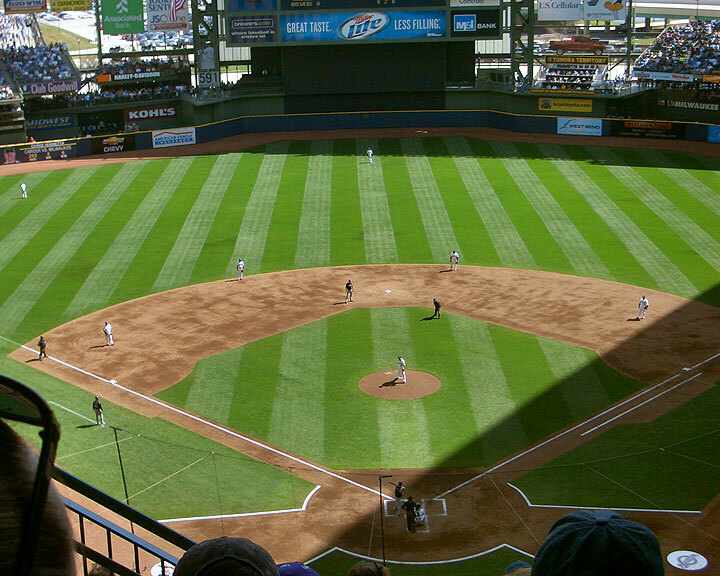 Despite having ace Yovani Gallardo on the mound, the Brewers fell to the Colorado Rockies 5-3. But over the course of the game, this group of friends and I exchanged stories about our backgrounds and our families and the games we attended in years past. As we made our way across the VA grounds after the game, our progress suddenly slowed. Apparently, Katie’s husband James had run into a friend he hadn’t seen in about twenty years. 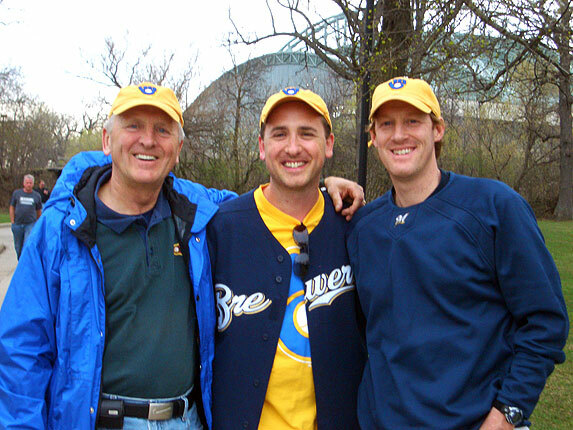 Mark Mohelinitzky and his father Bob were attending their 30th Brewers Opening Game in a row. That’s right, 30 Opening Days in a row. Don’t take my word for it; the Wisconsin State Journal put the father and son on its front page yesterday. It would be really hard to top the story of the Mohelinitzkys but running into them with one of Mark’s childhood friends was pretty special. And doesn’t that really sum up what Opening Day is all about? Seizing the opportunity to build a tradition with friends or relatives and sometimes making new friends in the process. By the way, my new friends from Marinette suggested that I join them for a Packers game in the fall. Sounds like a great subject for another story. NIce piece, Amy. Makes me wanna go. No, wait–I am going to the game tomorrow. Gonna be great. 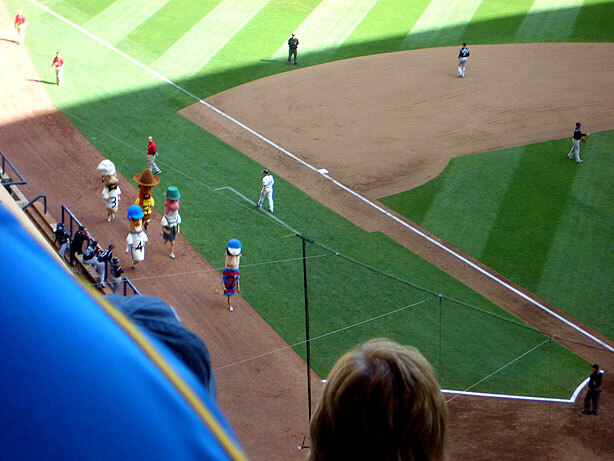 Why is baseball so strangely comforting?